Heat up a wide pan, pour oil, add mustard seeds. When they start to crackle add urad dal, chana dal, cashews, peanut, dry red chillies and curry leaves and saute for a minute in medium heat till they start becoming light brown. Add the shallots and green chilies and saute till onion turn light brown. Add the lemon juice and salt, add boiled rice when the lemon juice starts to boil from edges. Saute well till to mix everything and till the raw smell of lemon juices vanishes. Check for salt and adjust accordingly. Switch off the stove and move to a serving dish and garnish with coriander leaves if desired . Serve warm with Raita and pickle of your choice. 1. I was honored with 'Liebster' award again by Faseela at Good Food Ends with Good Talk and Ann at Anzzcafe . They both are extra talented people who own a wonderful space with lot of great recipes, please visit their space and encourage them with your valuable comments. Thanks a lot Faseela and Ann once again for this cute award. 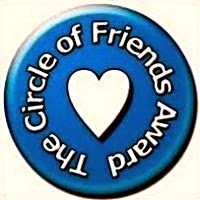 I would like to share this award with my blogger friends, I really wanted to pass it over to many more but since I am suppose to pass it over to five of them I felt hard to choose five here. 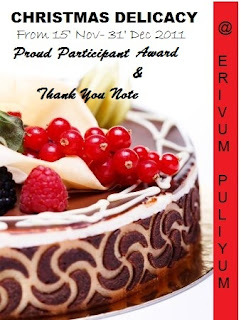 I'm extremely happy to receive this 'Fabulous Award' from Teena of Teenz' Yummy Delight. 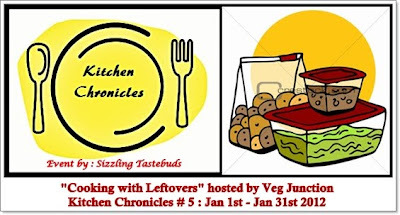 She posses a wonderful blog with very innovative and fabulous recipes. Check out her space and discover some of her wonderful recipes as well and leave your valuable comments as well. Let me pass it over to the following wonderful blogger friends. I was once again honored with the following wonderful awards and I'm really grateful to Nalini at Nalini's Kitchen for passing on these awards to me. 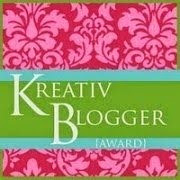 Thanks once again dear Nalini for this award, she owns a fabulous blog with great pictures and step wise instructions. I admire her for her passion towards cooking, friends please visit her space and explore her culinary talent. Now Let me pass it on to these blogger friends. Christy Gerald at My Kitchen Flavors - Bon Appetit! Julie Christmas Delicacy Event was a great success with almost 243 entries for the event and I'm really happy to be a part of it by sending in few of my entries. I'm extremely happy for her success and wish her many more success for her future. Julie is a really talented lady who own's her wonderful blog 'Erivum Puiyum' with great innovative ideas and recipe. So friends why wait check out her blog as well and do not forget to leave your valuable comments at her space as well. Very delicious n same here favourite jiffy meal too,esp for travel..
congrats on all your awards and thanks a ton for passing it to me..thank you!! Nice comfort food !! Congrats on ur awards and thanks a lot for passing it to me !! Keep Rocking !! Delicious and simple comfort food...nice clicks.. Happy to follow you too dear!!!! hi prathiba, lemon rice looks delicious, would love to try out, especially with nuts added. i simply love eating flavored rice. Delicious and comforting lemon rice.Congrats on all the awards and thanks for the award Prathiba. Congratulations of the award and a very colorful blog..will go through your dishes one by one and looking fwd to try them out! 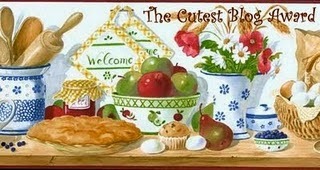 Thanks for visiting my blog you may also like to read my other blog http://messyhomelovelykids.blogspot.com/ enjoyy!! @All: Thanks a lot friends for stopping by and giving ur valuable comments n suggestion. thank you for thinking of me for the award..will display it on my blog soon..btww, Im waiting for your entries to my ongoing event. Hope you had a great anniversary.. Thank you dear for passing on the award to me :) am very honored. The lemon rice looks great. I prepare it for rush hour meals. Yours looks very delectable..! OMG.. Shower of awards.. so very well deserved. Thanks a ton for thinking of me and my little blog. We are very grateful for the share. OMG..shower of awards and so very well deserved. 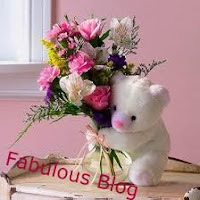 Thanks of thinking of me and my little blog, we are very grateful for the share. Congrats Dear and Wish U many more of the same in future. Thanks a lot Prathibha for choosing me to share it with U.Lemon Rice luks Cool.Well done and presented Dear.Yummy!. And thank you for thinking about me. congrats on all your awards and thanks for passing it to me. Congratulations for this award, your blog is great, you deserve it. Thank you so much for the nomination, it means a lot to me.